4. 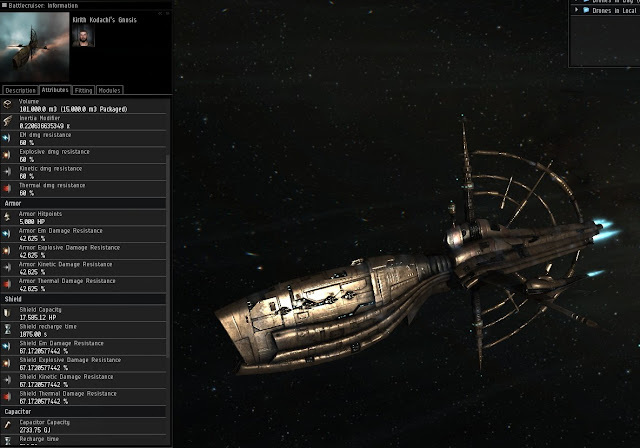 Tech II versions of the tier 2 battlecruisers (Drake, etc) and tier 3 battleships (Rokh, etc) as well as tech II carriers and dreadnoughts. I'd like to see some more non-combat-focused ships like a scientific explorer or a ship dedicated to managing the battlefield of multiple fleets or a ship specialized for salvaging. Well, the Gnosis vessel appears to satisfy this role at first glance nicely: damage bonus? Check. Scanning bonus? Check. Sufficient tank to survive rats? Well we are going to find out. First off, I'm a big fan of the model, very sci-fi and menacing, looking like a combination between sleek and strong. The slot layout and bonuses are setup so as to allow for any type of weapon system and defense, a jack of all trades if you will (and expert of none but we'll talk a bit more about that later). I decided to try a blaster fit with shield buffer thank and see how it compares to a Drake / Tengu. Note: I did not spend hours on fitting. First thing I found out is that you will have lots of fitting room on this ship unless you try to go for an Expanded Probe Launcher, then things get tough. With the Core Probe Launcher though I found I had no problems with power grid or CPU when going for Heavy Neutron Blaster IIs, two Large Shield Extender IIs, and two Adaptive Invulnerability Field IIs along with a meta MWD and webber. So yeah, fitting is a dream. With five mids and five lows and even resistances to start, there are no holes to plug and it does not favour armour tanking over shield tanking or vice versa. I went for shield tanking only because I wanted the mag stabs and tracking enhancer to improve turret effectiveness. I found I could get a fair amount of raw shield hits points with average resists (17K with ~68%) which is comparable to a Drake; you could probably squeeze more tank about of that with some tuning. I wasn't sure what to do with all the lows and could have easily fit a third magetic field stabilizer on there with the remaining CPU. The two nanofibers and MWD gave me a top speed of 1557 m/s which is very nice but I'm not sure if I had my low grade snake implants in at the time so your mileage may vary. The drone bay is 75m3 with a bandwidth of 50mb, so I went with Hammerhead IIs for DPS (expecially nice considering drone bonus ofthe hull) and a backup flight of Warrior IIs for interception. The damage with the hammerheads and Void ammo comes out in the 770 DPS range according to Eve client which feels a little low for a battlecruiser setup for damage; its not embarrassingly low but it is also not worth writing home to mother about. After looking at some other Battlecruiser stats I have come to the realization that the DPS of this ship actually is not half bad outside of the Attack versions (i.e. Tier 3s) especially considering the ease of fitting. Overall this is a very flexible ship. It won't out DPS some ships and won't out tank others, but it finds a nice spot in the middle road and the scanning bonus makes it as good as the Tech 1 scanning frigs for finding PvE content. I think I'd go with missiles and an active armour tank for a real serious PvE exploration boat. I might play with that one next as it would give more cap and range to play with while freeing up the mid slots for some code breakers / analyzers. Stay tuned. I've played with the Gnosis on the test server, tried her out in multiple fitting combinations in PVP. HAM, Armour Buffer = 500 dps, 80k EHP. Like a larger Sac. Didn't fare too well due to speed and low dps. Neutron Blasters, XASB fit = 700 dps, nice burst tank. High agility. This one worked well for a bit, killed two other BC's with it. Neutron Blasters, Armour Buffer = 700 dps, 80k EHP. Dual Web, Dual Tracking Disruptors. This worked like a dream, tough enough to tank the dps that slides past the tracking disruptors long enough to kill most Battlecruisers. Haven't engaged a Drake with it. All in all, I think the best way to fit this thing for PVP is with Neutron Blasters and an Armour buffer in the lows. The mids are pretty much wild cards aside from the normal point, prop and web. My disappointment with these kinds of ships is that you can't actually use them due to the high gank factor. If they would seed some BPO's of the ships this might get me excited about them beyond the one day novelty factor. This ship is making Noob Tax look worthwhile. I feel a bit faint. Can't that Chimera in the background launch as small rokh as drone? That gnosis seems strong, 6/6/6 slot layout, omni resists, all medium weapon systems viable. No predicting what you will be facing. 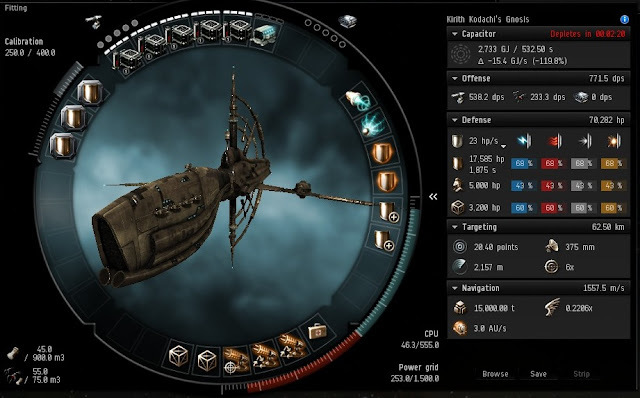 Here's to hoping SoCT's 10th year gift is the BPOs seeded on the market for that thing and not the ship itself ^^ the ship itself only really needs its skill requirements put in to be a viable and quite balanced PvE ship (something wild like level 2-3 in all racial cruisers as a prereq with a new exploration cruiser skill as the proper skill for the ship itself).